Here's my mini-BOB. 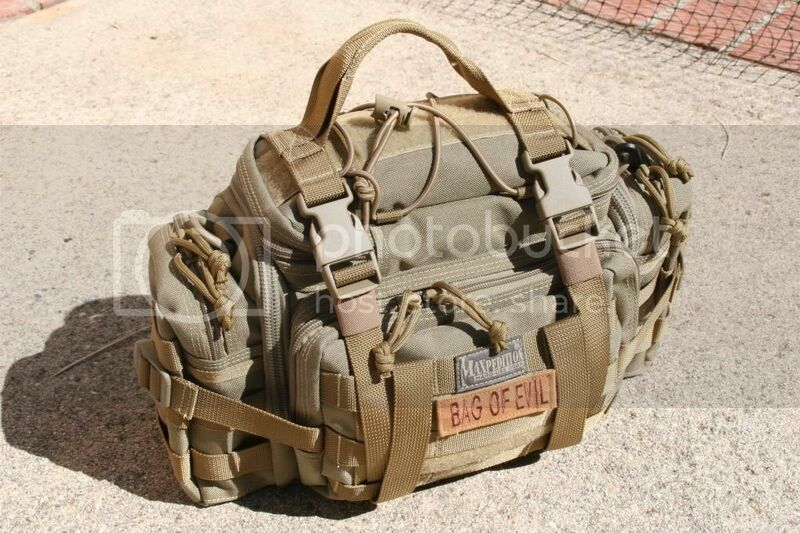 I'm sure many have seen these lil' ubiquitous bags on various forums or survival/tactical websites. 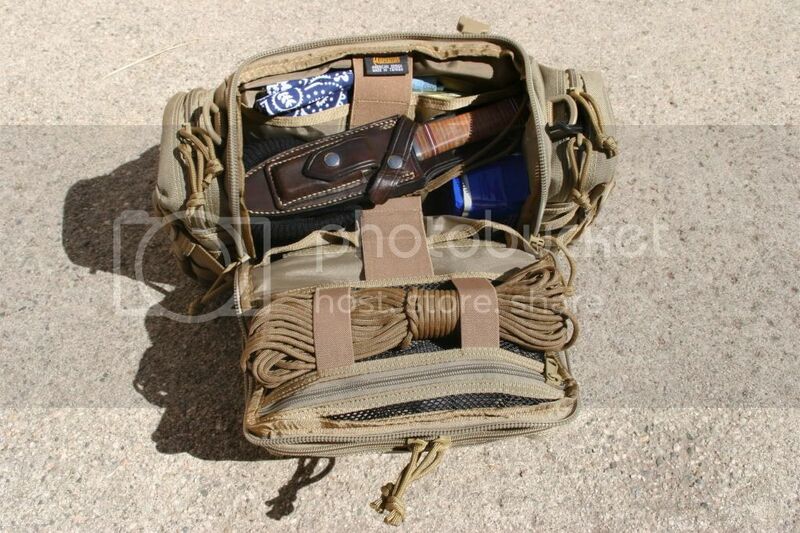 They're sold as molle bags or as how I use them, as mini-BOB/urban BOB. They take a surprising amount of STUFF..
Also holds about $4 in loose change scattered on the bottom..
Um, that's about it. Hope you guys enjoyed the tour! HERE'S MY B.O.B. 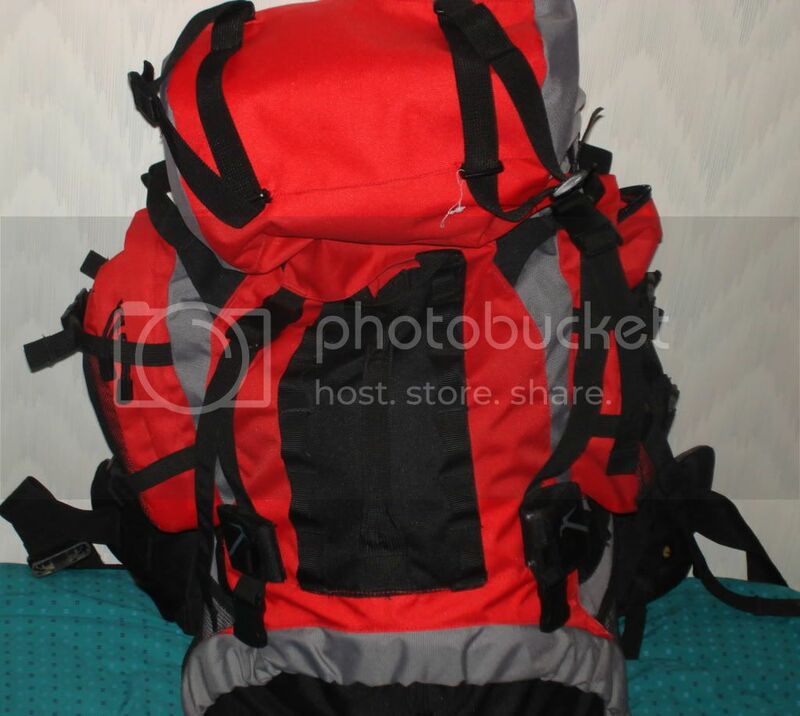 Sure its bright red, but I'm planning on getting found and i didnt pay that much for it and it's a great pack! Here's my gear in my B.O.B. my hammock, some food, two hydration bladders, and of course my smith & wesson! "Two to the chest, one to the head"
This is what I've been piecing together...mostly old army gear and other things I've used in my travels. In the bag behind it all I have a tent, mummy style sleeping bag and small air matress. 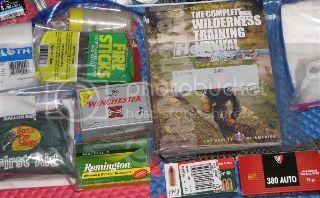 In the possibles pouch I have matches in a waterproof pot made out of an old shot gun cartridge, carabina clips, water purification tablets (also have them in the first aid kit and my water bottle pouch) and other odds and ends that might be usefull. 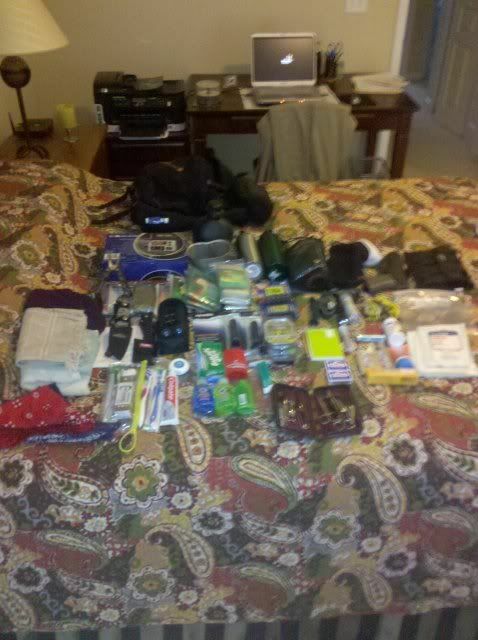 Most of this fits in the outer pockets of the bag. 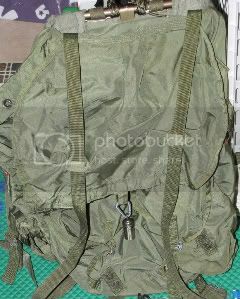 M12 100Ltr capacity tactical bag. I use it for travelling and BOB. 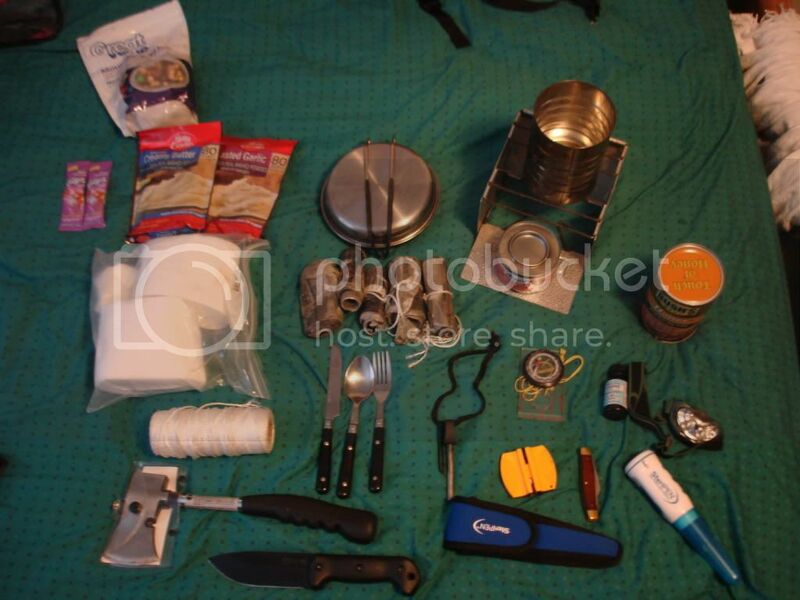 Pretty good for camping too if on foot but I usually cycle into the woods when I camp and use my bikes pannier. 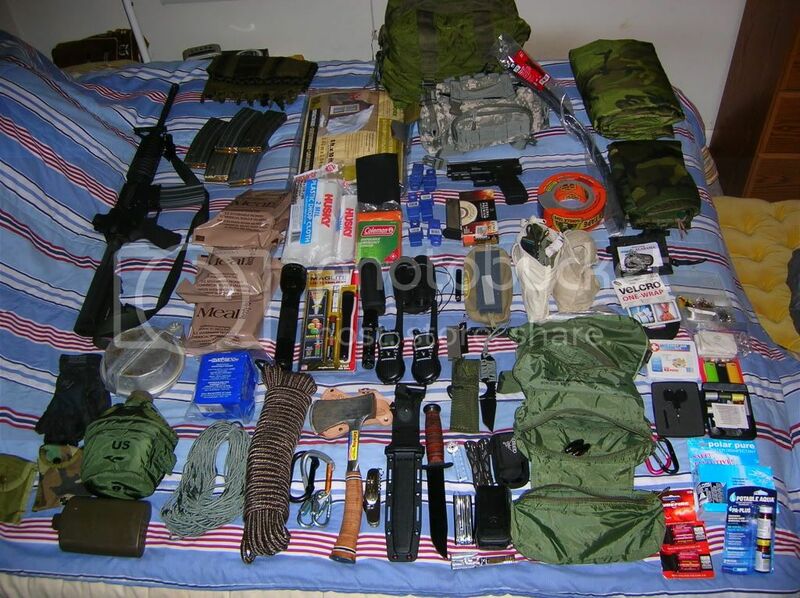 Forgot to mention the S10 Gas mask and Omega 4997 multi-band radio. 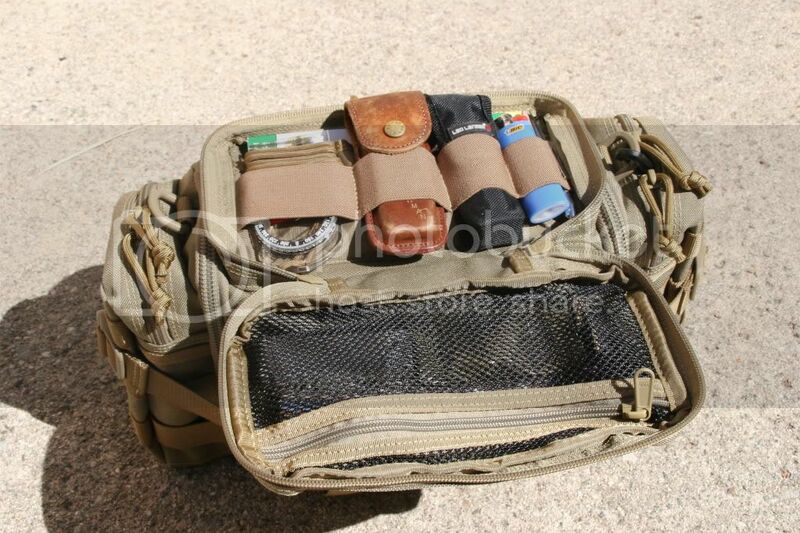 Here is my EDC Bag. 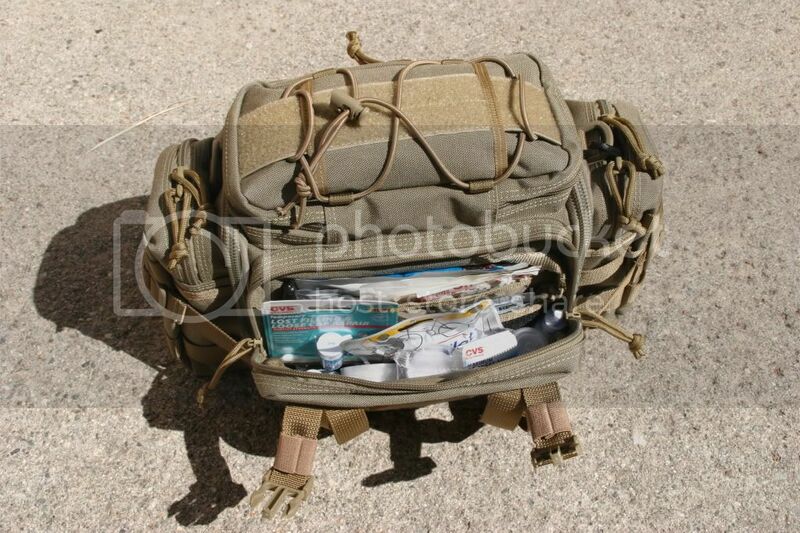 The bag is a Maxpedition Sabercat, which can be carried as a hand bag, or worn as a shoulder bag or a hip pack. 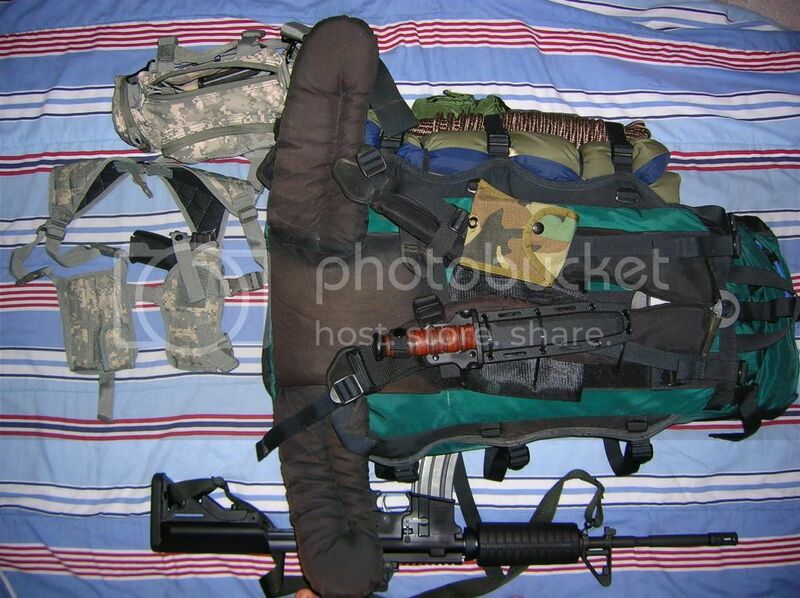 It has lots of pockets, retention straps, pouches, etc. If anyone has any suggestions for the items I'm looking to add, or anything I may have missed, please let me know. 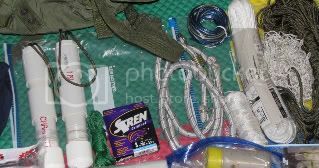 Found this photo of a Polish Survival Pack. 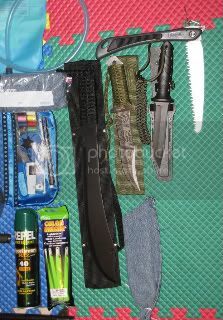 This is my EDC get home bag. It will live in my trunk. I chose the Eastern Mountain Sports "Free Range" bag. I decided upon this, over using my 3000cu inch expedition bag. Living and working in a primarily urban environment, I wanted something that offered more maneuverability, and was a bit more low key. If anything were to happen, I will be mostly following main roads and highways. This is still a work in progress. More things are going to find their way in. I attached my fixed blade to the shoulder strap for easy drawing. So here it is... my BOB. Before we start I built mine with the intent of being able to survive for upwards of a week or more away from home. 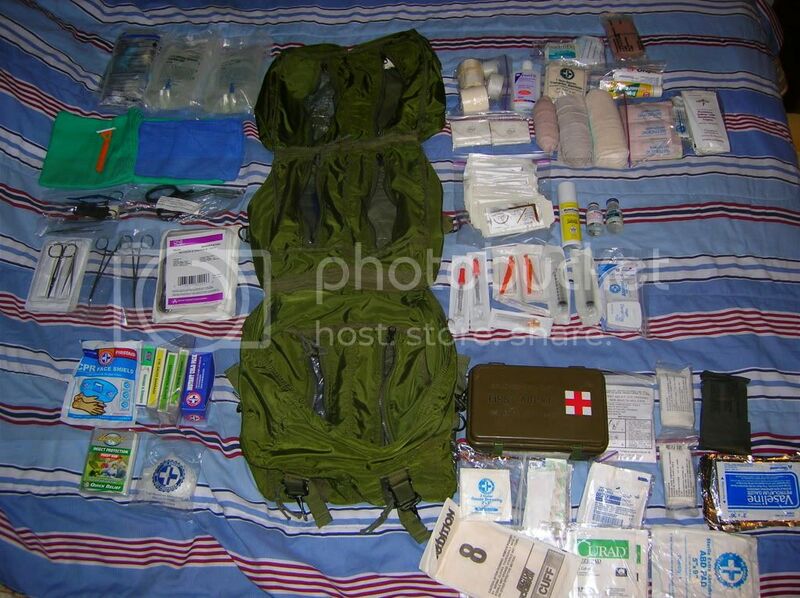 I could with this pack completely abandon home and go on the move. However I have to think about my family. I have a wife, and two sons in tow when we move. More on that at the end. Your basic large Alice pack. Here is a wide angle of everything in it. Below is a 30-06 make I don’t know it was handed down from my grandpa to my father, to me now. A survival book, first aid book, and a book about knots and what not. One pack as trash bags, baby wipes and TP. Last but not least enough clothes for five days compressed in a space bag. 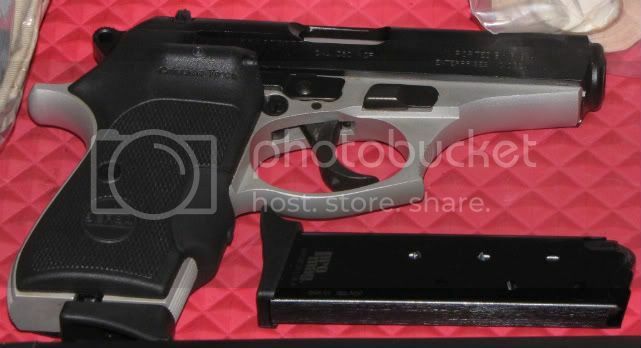 Ok so as mentioned before I will have three others in tow with me when we have to bug out. It’s possible up to four others as well (Family living close by). One of my sons is 13 no worries about him really. My other son is only 16 months though so that poses a problem. My wife is a city girl who rejects the idea of having to bug out to a remote location. 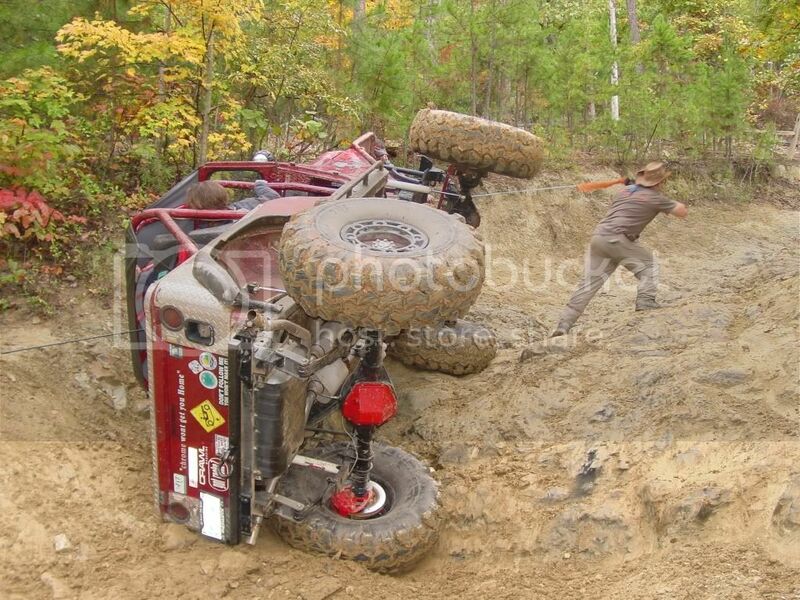 As you can see from the above pics I am set. I have another large ALICE and I was thinking of stuffing clothes for them in that one and my older son can carry it. That way my wife can tend to the baby while on the move. As far as food goes I have not purchased what we will use yet, but it’s coming soon. 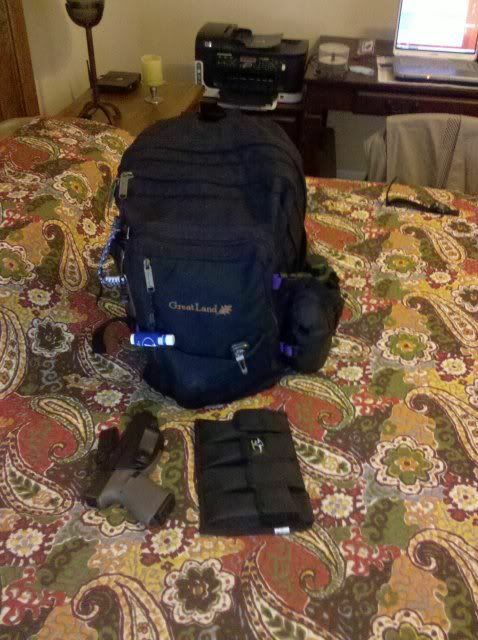 My pack as it is now with what you see above is 43 pounds and I am good with that. So what are your thoughts? 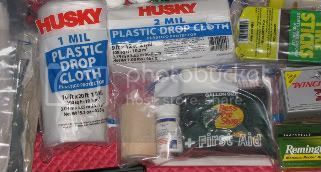 FYI I have not finished the pack I need a couple more things like weapon cleaning (this is for longer term bug out), and a few more bladders. How many clothes do you have packed in that "space bag," Mainstreet? I pack this because I am a sweater... Now when the weather changes the bag will change. Now with that said I am accepting the fact that I may have to wear these clothes for two days each. I have soap in the BOB to clean whatever. Plus in my map pack I have directions on how to make soap and other cleaning products. I have directions on how to do all sorts of other things that is because my wife is a city mouse. I could if needed add another two to three sets of underwear to the pack, and shirts. I am using a large space bag. It fits perfectly to my Large ALICE pack. What I have now fits perfectly in to the right corner of the pack I will take a pic and show you where it is. I cleaned my closet today and added a bunch of stuff to the space bags, I ran out. 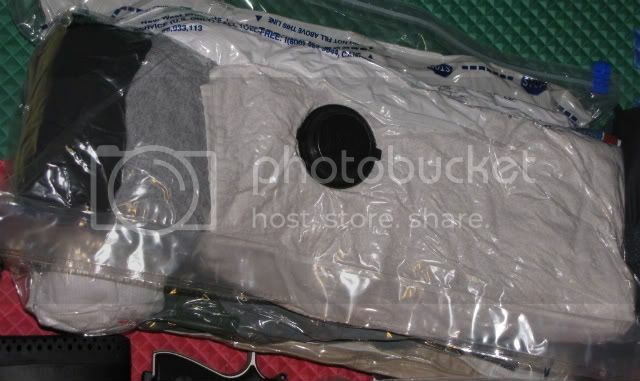 I used a normal trash bag with draw strings, I placed the vacuumed on the clothes and bunched the bag up around it and sucked out the air. 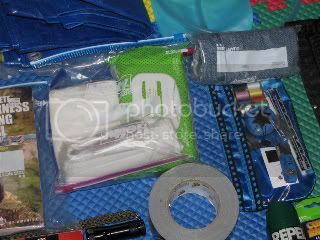 I did not seal the bag I am going to check the bag in a few days and make adjustments as needed and post them. You can make space nags out of anything as long as you keep the air out of it. This option saves so much space. I can get up to two weeks of clothes in this space bag with the space bag, your question got me wondering. Now with that said if you do two weeks of clothes then you sacrifice over 1/4 of your bob. I plan to vacume seal most everything in the bag. Once I have this done I will post pics. Sorry y'all but right now I am scanning all our inportant docs and put them on a flash drive. FYI some of these bag leak, so test them before commiting them them your long term BOB. Keep in mind that these items are compressed, so if you open them then you can roll and compress them again (as many times as you want, but I don't think you'll get the same type compression as useing a vacume. So plan for that.) 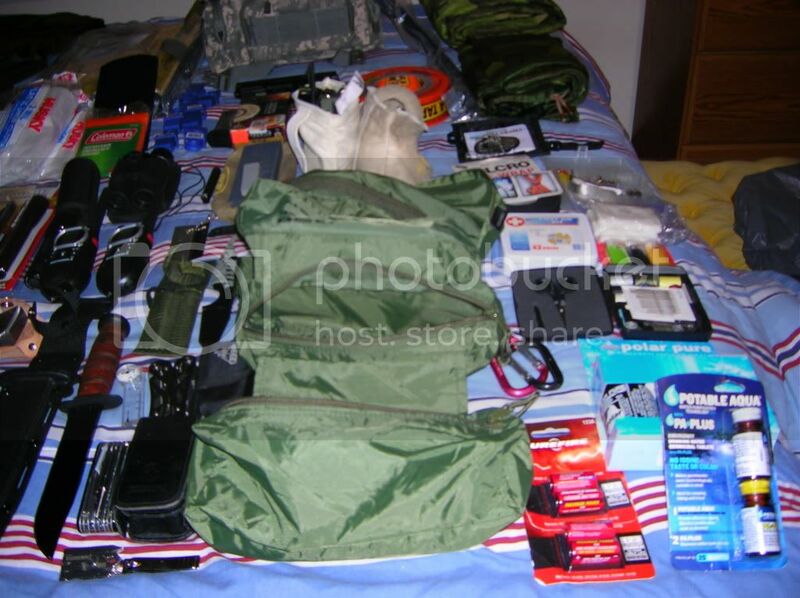 I plan on packing all my family's clothes in the other large alice pack and anything else missed (Food for up to two weeks)once I have them all in order I will post pics. Not sure how to edit my previous post as I need to add the pictures again so posting them here instead. I wont list the contents again as its all a few posts above. I'm not going to list everything individually, I think you can pretty much tell what I have. 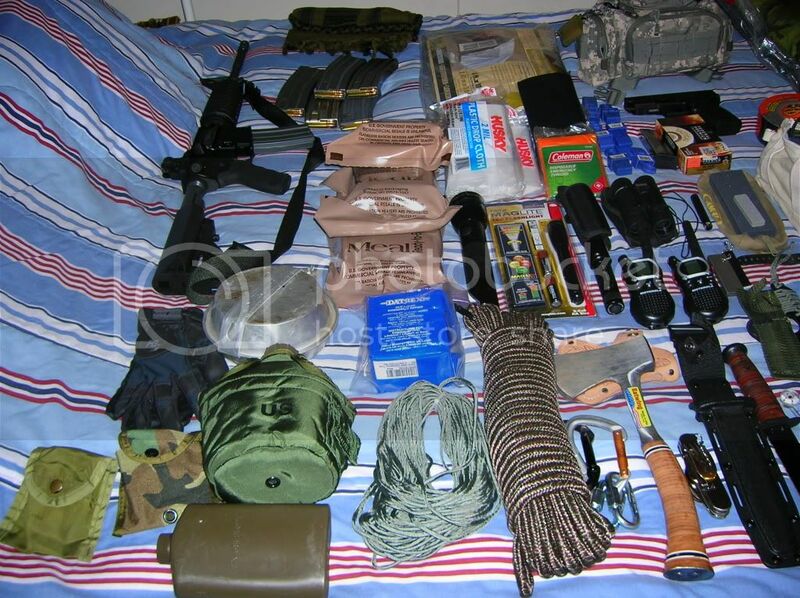 The pack with contents weighs about 45lbs without ammo and weapons. 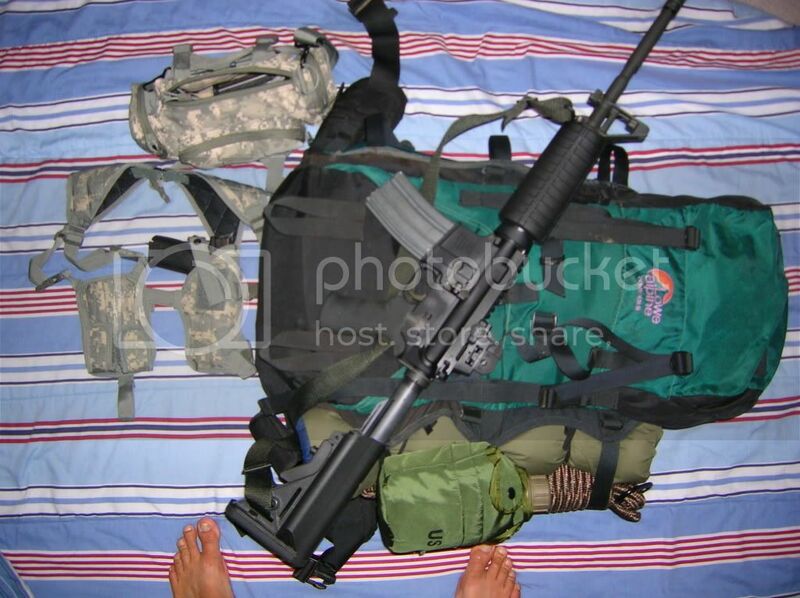 I've had experience lugging heavy packs around in the military (alot less comfortable packs) and practice from time to time with some day hikes to keep myself in shape. 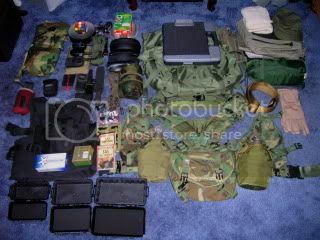 My wife and 5yr old daughter, and even my dog have their own packs however I cary most of the gear. Theirs consist of mostly personal items, a little food, and extra water. If anyone has any questions or input on what I've got or lacking please feel free to comment! I did leave out a folding wood saw that I picked up the other day. 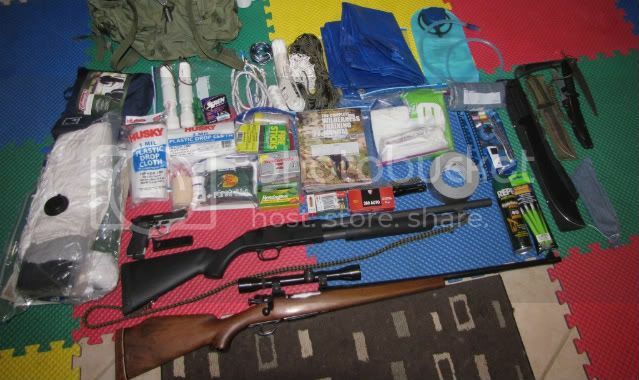 Also the clear plastic case on the far right side of the contents of the bag is a small fishing tackle box. Also the 6 small blue clips in the center towards the top are tarp clips. 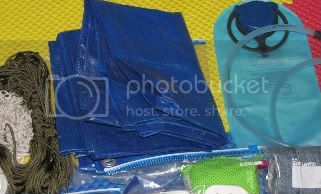 Clips that lock onto a tarp which allow you to attach rope without putting holes in it! I think everything else is recognizable! Road Flares; great for starting a fire under difficult situation and EXCELLENT for keeping a crowd away. One in each hand will keep most away without using lethal force. Some fantastic ideas here, nice bags ive learnt a few things about what is important. I have ony one comment - I don't see too many socks and foot powder here. If you are bugging out, and need to do a lot of hiking, you need to change your socks REGULARLY. Like at least twice a day. Other than that fellas, nicely done! I have 2 pairs of socks in my BOB. Thanks everyone for posting pictures and gear list, gives me somewhere to start building my wife’s and mine.